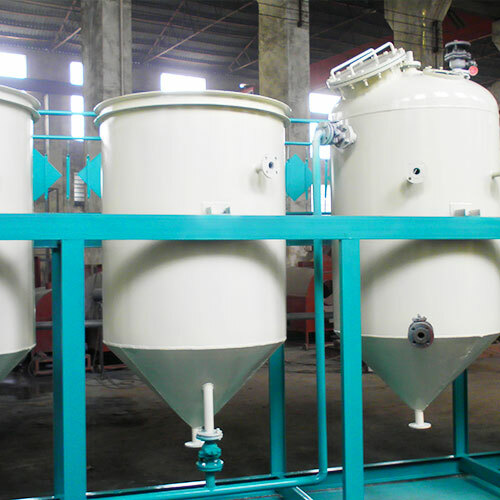 Chemical refining equipment, oil refining equipment to achieve the aim is to remove the oil pressing or leaching solid impurities, free fatty acids, phospholipids gum, pigments, proteins, drilling fluid quality, odor and moisture and other unwanted or harmful impurities. Thereby improving fuel quality and expand oil use, easy long-term storage and to meet the different requirements for human consumption, industrial use and so on. Oil refining methods include mechanical, chemical, physical and chemical method. After the impurities contained in the crude oil according to the nature and purpose of refining oil and taking into account technical and economic indicators, using different methods and processes. Today we want to introduce is the physical and chemical methods. Refining equipment, including physical and chemical methods of hydration, adsorption bleaching, deodorization, distillation and liquid-liquid extraction, use more equipment. The basic process of oil refining, including: initial net (gross oil purification), degumming, deacidification, bleaching, deodorization, dewaxing, degreasing and so on. The same process continuous and intermittent, small-scale oil refining plant to use more general batch or semi-continuous. The main equipments are indirect, continuous, semi-continuous equipment and filtration equipment, including filter, oil refining pot, bleaching pot, sweetening the pot, hydrogenated tanks, Centrifuges and so on. Here only frame filter press and refining oil plant commonly used in small pot.